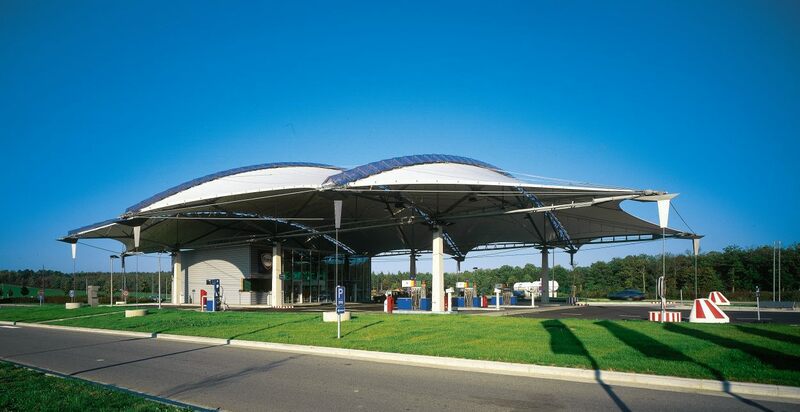 Open fields and woods in an undulating countryside characterize the sites for two service stations in Wanlin along the Brussels-Luxembourg E411 highway. 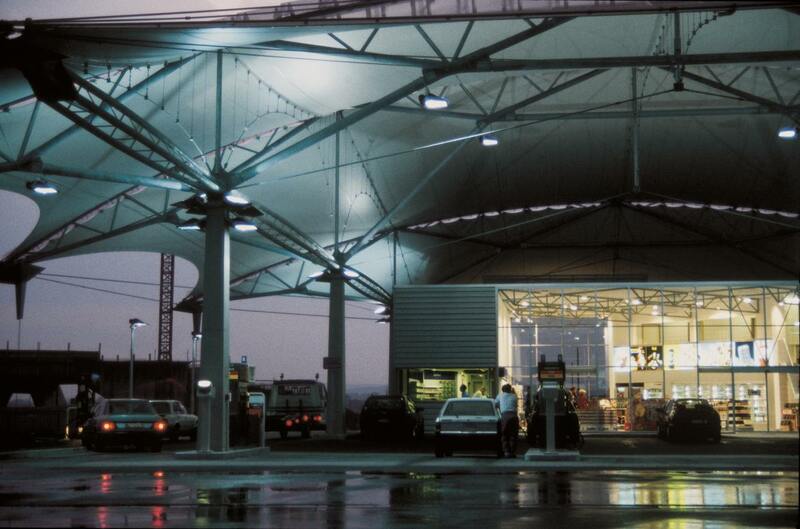 In keeping with the improved performance and comfort of automobiles, the stations are conceived so as to provide both oasis and inn to passengers. 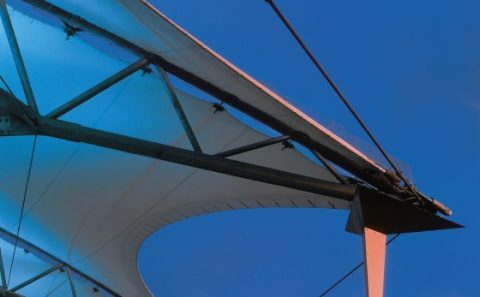 As such, they are a dramatic departure from the traditional image of a single steel awning bordered by a garishly coloured frieze. 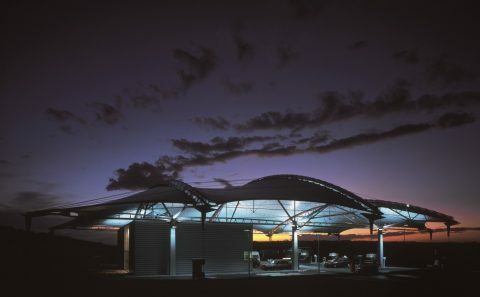 Each station consists of a vast 2.000 m˛ translucent textile structure covering the entire site, including the refuelling zone and the reception and commerce building. 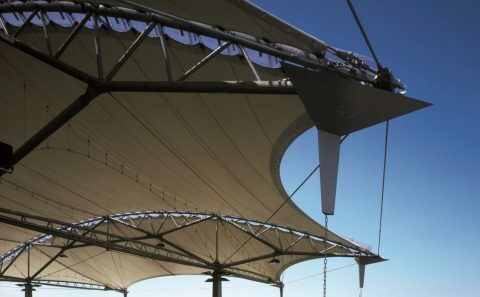 Such structure shades passengers from the sun and also provides shelter from rain and snow. 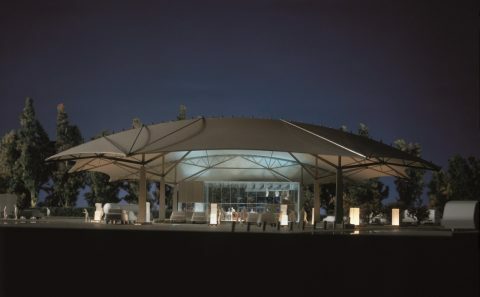 The reception building is conceived as a large 5.4 m high windowed box that gives an impression of space and ease in contrast to the often confined and oppressive atmosphere typical of such buildings. 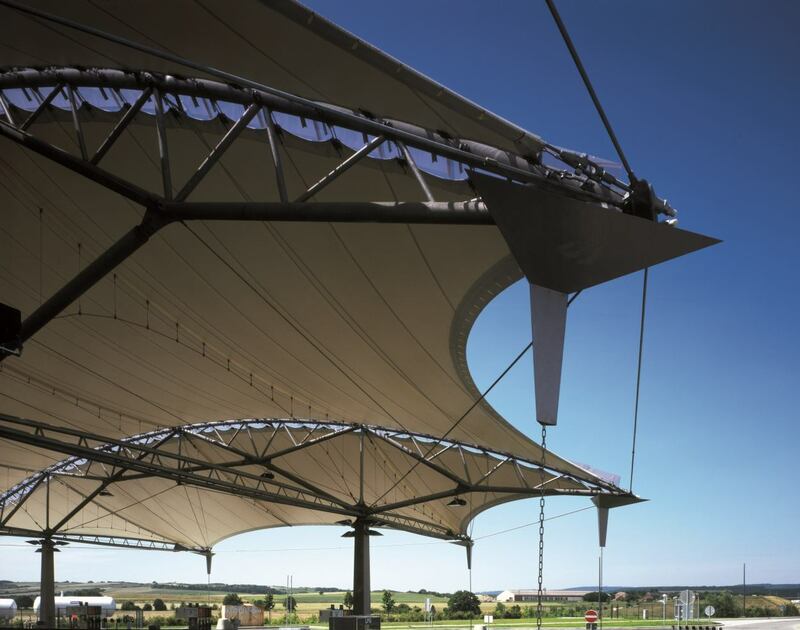 One 44 m long curved beam and two 44 m long beams connected by a serie of tie beams and studs provide the underpinnings for PVC polyester-coated pre-stretched tarpaulin. 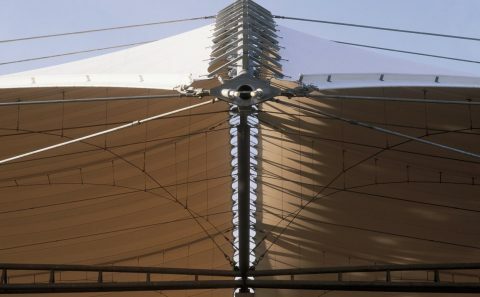 Slightly curved tension cables placed under the fabric stabilise the tarpaulin, making it resistant to wind depression. 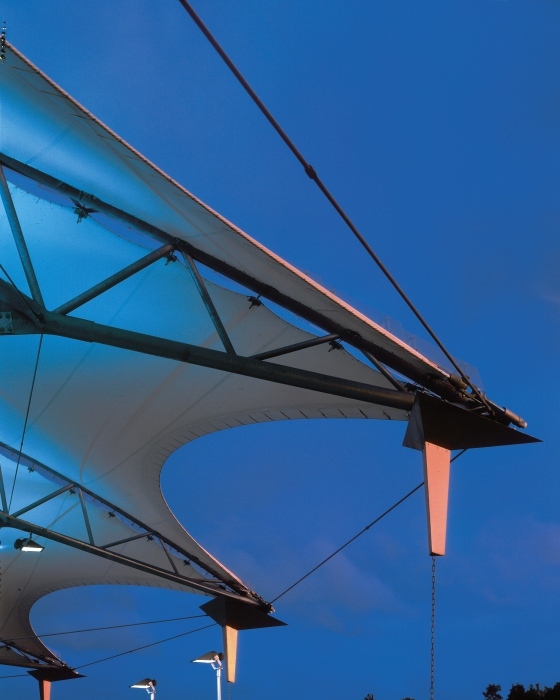 252 transparent PVC shells ensure complete cover between the canvas and its framework. 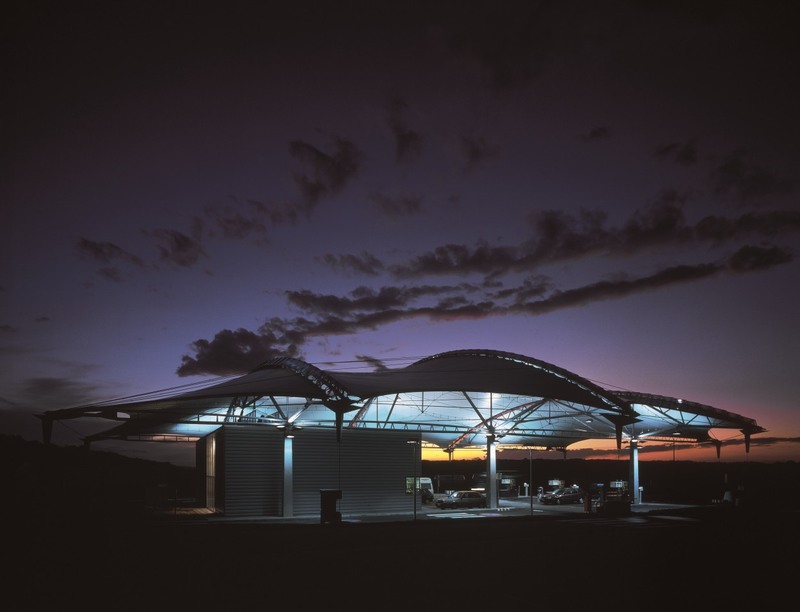 01-314 service STATION, WANLIN (E411). Architecture: Partner in charge : D. Mélotte. Associates : Gh. André, Y. Avoiron, F. el Sayed, L. Finet, C. Geldof. BOUWEN MET STAAL, n° 128, January – February 1996, pp. 22-26; (The Netherlands). 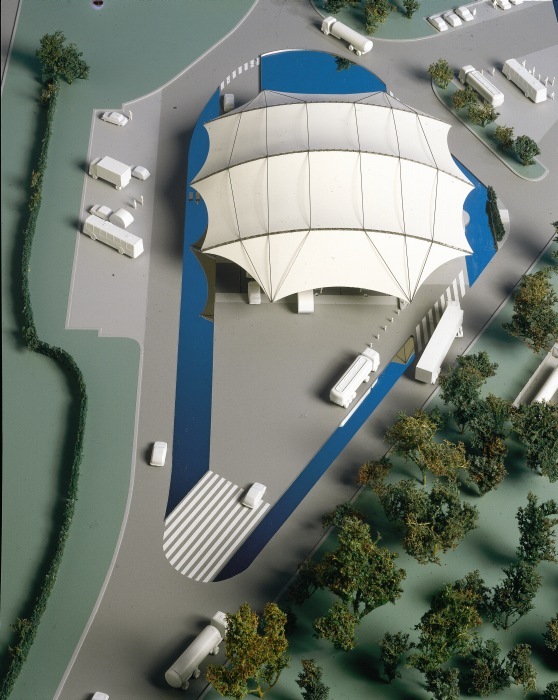 ASIA-PACIFIC CONFERENCE ON SHELL AND SPATIAL STRUCTURES, CCES-IASS APCS ‘96 – May 21-25, 1996;pp. 162-169; (China). 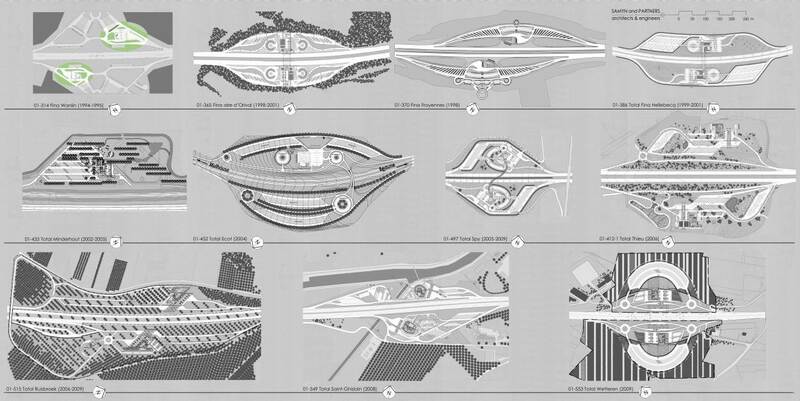 Tony ROBBIN «Engineering a New Architecture», Yale University Press, New Haven and London, 1996, pp. 20-23, 102, 132 and fig.17; (United States). International Lighting Review, n° 96/1, cover and pp. 1, 16-19; (The Netherlands). BULLETIN DE LA CLASSE DES BEAUX-ARTS, Académie Royale de Belgique, 6th serie, part 7, 1996, 1-6, pp. 55-58; (Belgium). BOUW WERELD n°21, Novembre 8th 1996, pp. 5, 14-17, 32; (The Netherlands). BAUEN MIT TEXTILIEN – TEXTILES IN CONSTRUCTION, n°1, May 1997, cover + pp. 46; (Germany). FABRICS AND ARCHITECTURE, March/April 1997, pp. 41-43; (United States). 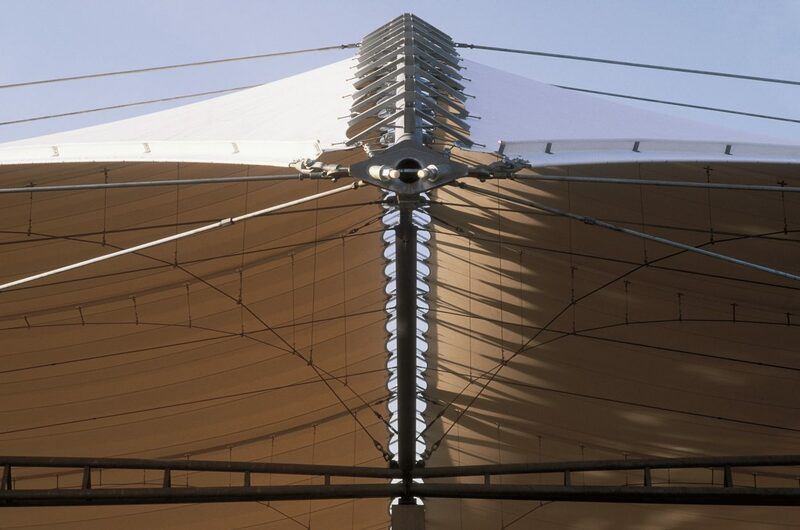 Hans-Joachim SCHOCK «SOFT SHELLS, Design and Technology of Tensile Architecture», Birkhäuser,Basel-Berlin-Boston, 1997, cover + pp. 26-30, 43-47,136-140; (Switzerland). 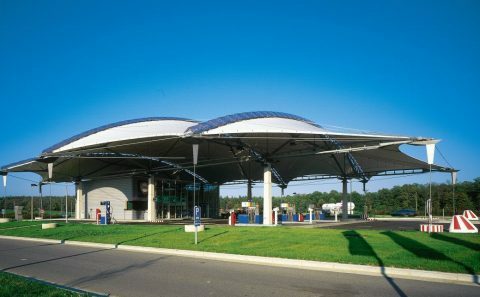 ARCHITEKTURA – MURATOR, n°6 (33) Czerwiec 1997, pp. 79-80; (Poland). INDUSTRIAL TEXTILES, Autumn 1997, n°18, pp. 9-12; (Great-Britain). 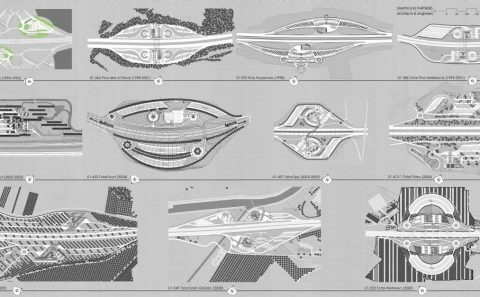 ARCHITECTUUR & BOUWEN, November 1997, jaargang 12, pp. 42-45; (The Netherlands). L’ARCA n° 123, February 1998, pp. 50-55; (Italy). 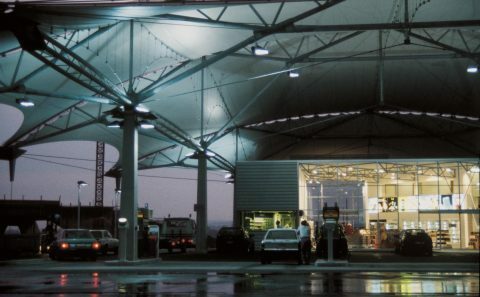 DAS BAUZENTRUM, Fachzeitschrift für Architekten und Bauingenieure, 2/97 March, pp. 28-31; (Germany). CONCEPT & PLAN – Kluwer editorial (D/1998/2524/12) (ISBN : 90.6716.969-2). First delivery, October 1998; pp.30/1-18; (Belgium). 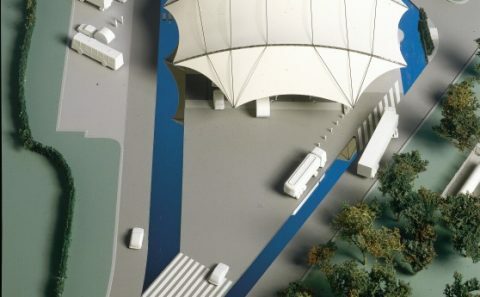 INTERNATIONAL PRIZE FOR TEXTILE ARCHITECTURE, May 12th 1997, Frankfurt; (Germany). STAALBOUW WEDSTRIJD CONCOURS CONSTRUCTION ACIER 1998, Nominated in category B for roof structures (Specific steel construction elements); (Belgium). 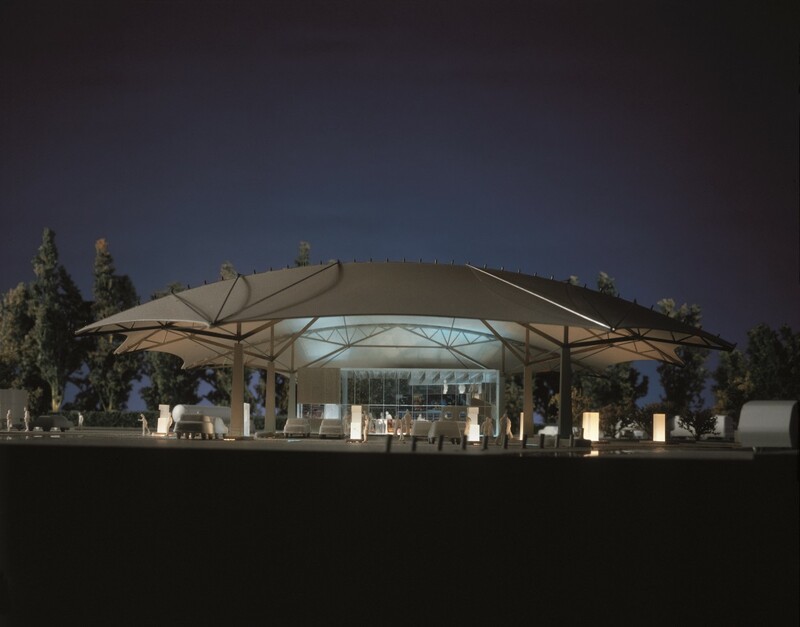 INDUSTRIAL FABRICS ASSOCIATION INTERNATIONAL 1996 International Achievement Awards; Outstanding achievement in the category «Air and Tension» structures 10.000 to 30.000 square feet; St Paul, Minesota; November 7th 1996; (United States). (A) F. Loze & Archipres Paris.